In this report, Dr. Franks provides some more granular advice on issues such as “what are the characteristics of a ‘record’?” when social media is involved. 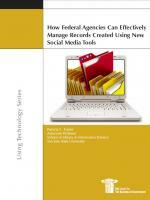 She also provides a framework for understanding records management issues in a Web 2.0 world for agency records managers, web masters, chief information officers, and social media offices. She also offers recommendations, best practices, and practical advice on ways to transform the way records and records management programs and practices are conducted across the government.